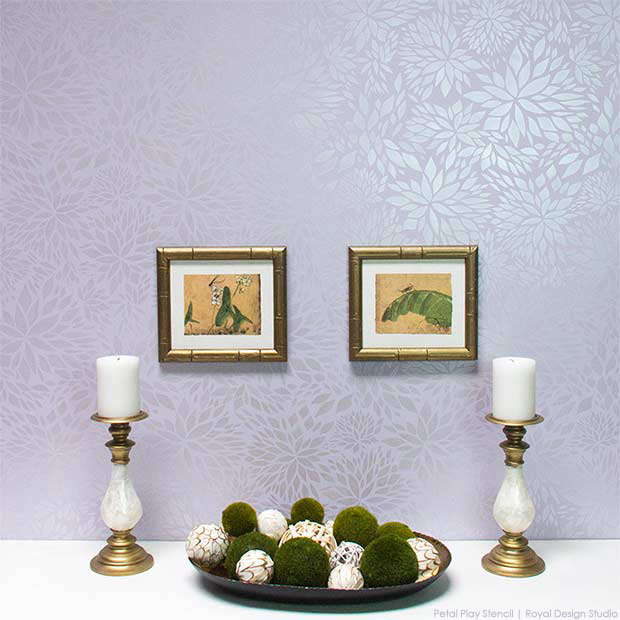 Our Pearl Oyster Royal Stencil Creme is one of our best selling colors. It’s easy to see why! It simply pairs well over any color of paint. We paired it here over Behr Premium Plus Ultra paint in a color called Posture and Pose with a newer stencil in our Bonnie Christine Stencil Collection: Petal Play. Royal Stencil Creme paints are designed to be used with our high-quality Stencil Brushes. 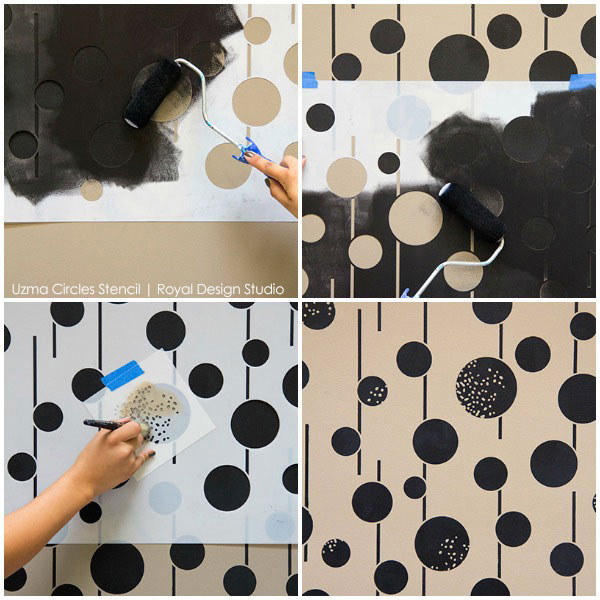 Stenciling with brushes offers much more control than stenciling with rollers. Other advantages are that you use a lot less paint and have very little to no paint “bleed-under” as long as you remember to offload your brush onto paper towels each time you reapply paint. 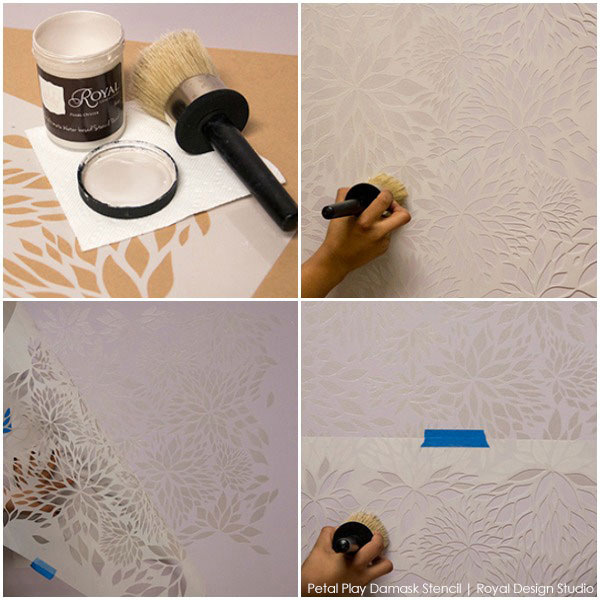 The 3″ Super Large Stencil Brush shown here makes stenciling a larger scale pattern a breeze. The densely packed bristles hold a large amount of paint so you can stencil farther and faster with each load of the brush. 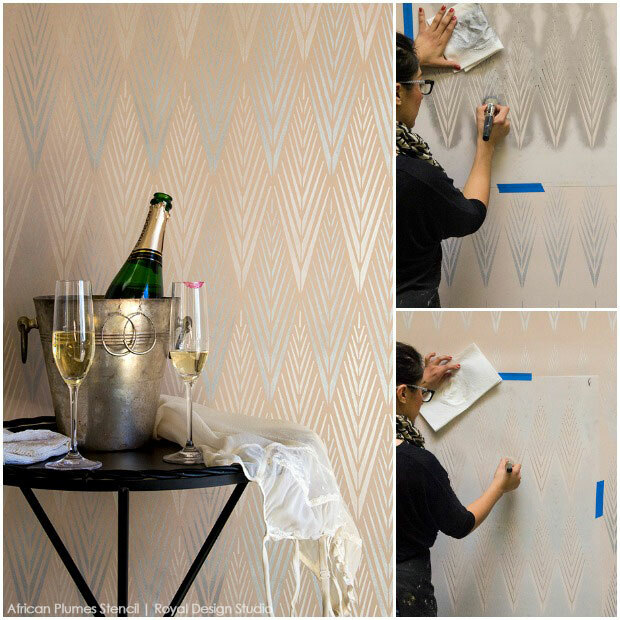 Stenciling with Pearl Oyster Stencil Cream looks particularly pretty over light pastel colors, as stenciling with it gives the look of a shimmery damask fabric that changes depending on the light and your point of view. Antique Silver Stencil Cream helped us transform a $5 thrift store table into a shimmery showpiece in a very short time. 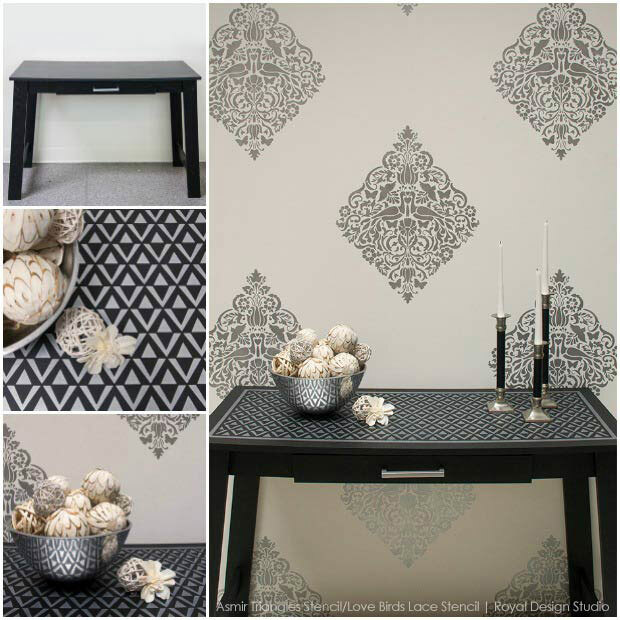 The clean lines of the table called for a geometric pattern and the Asmir Triangle Furniture Stencil was the perfect fit. For this effect we placed 2″ painter’s tape around the edges of the table to create an inset pattern. After finding the center point of the table top we began the pattern centered there so that it ends the same way at each edge. More tape was then used to mask off and stencil a 1/2″ stripe all around for a fabulous finishing touch. Alternative colors of Royal Stencil Cremes create a simple 2-toned dimensional effect with the African Plumes Wall Stencil above. For a more subtle look we mixed 1 part Pearl Oyster Stencil Cream, with 1 part Antique Silver Stencil Cream to create a soft silver color and did that on every other row. Then in between we simply used the Pearl Oyster color. 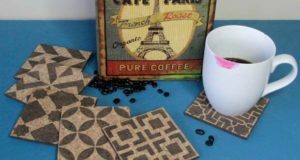 Pairing multiple colors within a pattern is a simple way to further customize a stencil design. Another 2-toned stencil effect is shown above with the Mughal Trellis Wall Stencil. A good trick to get a nice complimentary colors is to use a variation of the same color as your accent. For this stencil treatment we combined 1 part Aged Nickel Stencil Cream and 1 part Smoked Oyster Stencil Cream to create the lighter color. Then, we used the Aged Nickel color alone for the darker color. Since each color includes the Aged Nickel color the two hues marry well together, and the result is soft, pleasing, and quite stunning. Use smaller stencil brushes will allow you to limit the stencil paint to just the design elements you want. 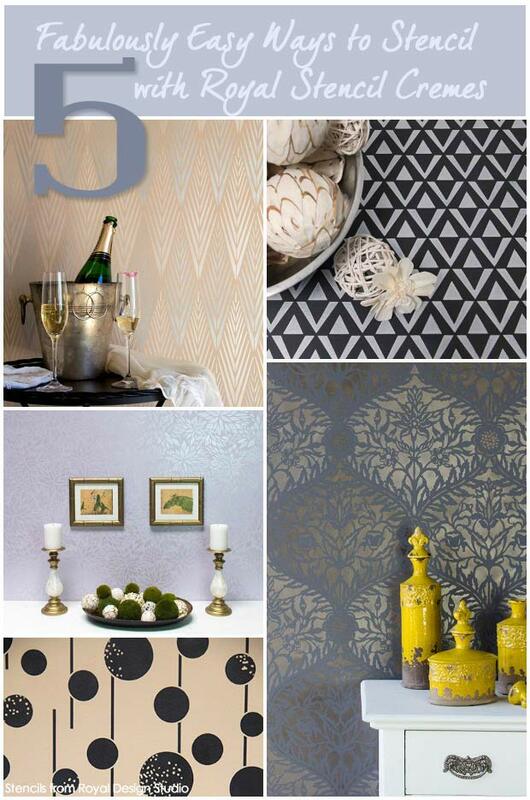 Besides a wide range of metallic paint colors, we also have created a Flat Black Stencil Cream. 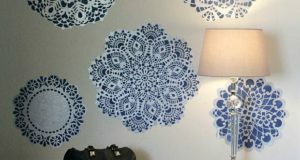 Here, we used it over Behr Ultra Premium Plus Ottertail with the Uzma Circles Wall Stencil. In this case we used a 4″ stencil foam roller to apply the black stencil creme quickly and evenly. The Uzma Circles stencil comes with an extra little pattern texture detail that you can place as you wish within the circles. It adds a fun, custom detail that allows you to bring in another accent color, or simply used the background color of the wall as we did here. 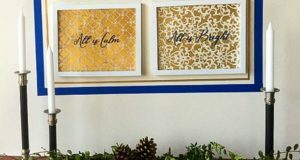 If you are looking for even more inspiration to try using Royal Stencil Creme paints yourself, look no further than the dozens of stencil projects and how-to tutorials with Stencil Cremes we have posted here on Paint + Pattern. Have fun stenciling!! May I please ask what background color you chose for the two-tone African Plumes Stencil? I am planning on doing something similar but with a light grey background. 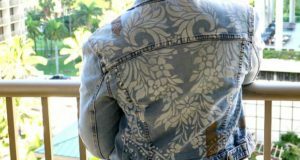 In this case, would I be better off to use the Pearl Oyster and Smoked Oyster Stencil Creams for alternate rows or should I use the Stencil Creams you used above in your project above (i.e. Pearl Oyster and Antique Silver)? Hi, when using Annie Sloan chalk paint do you wax then apply the metallic creme. Thank you. I loved as much as you will receive carried out right here.The sketch is attractive, your authored material stylish.nonetheless, you command get bought an edginess over that you wish be delivering the following.unwell unquestionably come more formerly again since exactly the same nearlya lot often inside case you shield this increase. Jordan spare metallic element Superfly SP “dimly lit intermediate” dye, is about to issue since to dying Gregorian calendarmonth, now that are leaving place shop spar, quotes ascended to the top in regards to Jordan discharge Mercurial Superfly HTM horseshoe maintains an intense appearance on your file, avoid associatesdon’t lose centre, Apr press remarked that typically the Jordan for free Mercurial Superfly SP is going to start-up this method thirty day period, your deep blue kind presently startpast supply, Jordan free of cost Mercurial Superfly SP southern type ofthe fresh merchandising at the same time supply admonitory data, it is recognized your each fresh Dark gray pigment of Jordan relieve Mercurial Superfly SP is going to technologically country sale being made 24 that this30 days, us states instant. Anyone can observe that the two main more colour from the “.htm “ring, nevertheless such great for your destiny scientific disciplinein addition to a concept in colorize case is able to boost, reoccurrence ofthe adjustable-get together awareness purchased? You continue to lookto discover! Want to have a new confrontation ordnance guests will not miss eating start-up big date!